One of my new favorite blog friends Joelle emailed me a few weeks ago asking if I wanted to go with her to the Jimmy Kimmel taping where TAYLOR LAUTNER would be a guest. I couldn't write back fast enough to tell her YES! Well, that blessed day was Monday! Since I was meeting the girls in Hollywood, I decided to go a few hours early just to walk around and pretend I'm famous. Once I had a salted caramel mocha in hand, I strolled around Hollywood Boulevard, taking in all of the sights and, of course, crazy people. There was a movie premiere going on at Grauman's that night (see the red carpet?) and I later found out that Jennifer Garner was there! Eventually, it was time to get in line and meet up with Joelle, her friend Carrie (who really needs to start a blog so I can talk to her more!! ), and another new blog friend, Maegan. We made our way into the studio, lucked out with great seats, and seriously laughed non-stop for the next several hours! Herman Cain was the other guest and was pretty entertaining, too, considering the accusations made against him that day. Maegan also surprised all of us with the sweetest gift. Thank you so much girl! I absolutely adore these earrings! After the show, we headed over to Hard Rock for some dinner, where we received truly the worst customer service EVER. By the end, we just had to laugh about how many things had gone wrong. By the way, have YOU entered our Ornament Swap? Click on the button for more info! ahhhh look at youuuuu on tv you supah-stah!! :-) I love it! im dying to go to Cali...it just looks like an amazing place to visit and i need to see the roosevelt hotel! so jealous you got to meet other bloggers...im due for my next BLATE!! This look like so much fun! California is such a fun place; there is so much to do! 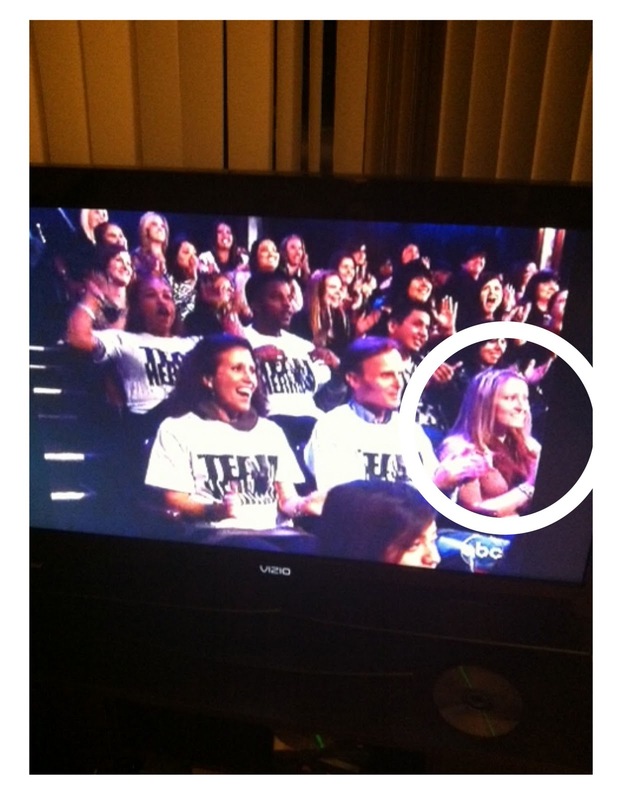 I am jealous - you were in the SAME ROOM, breathing the SAME AIR as TayTay!! Oh, yum. What a fun evening! How cool seeing yourself on TV too. Hey Jules! So i came across this blog and thought you might be interested in helping this sweet girl... Its right up your alley with animal lovers and maybe you could post on your blog? I'm so glad you loved the earrings! I didn't know who Maegan was giving them to but I'm glad it was you. :) Sounds like y'all had a blast!!! TAYLOR LAUTNER?!?!? AHHHHH!!!!!! I have a bit of a crush on Jimmy Kimmel, too. He's so funny and seems normal. I love it. That sounds like SO much fun! I wish I lived near you!! By the way, you BETTER post every time you're on TV! I want to see it!! Haha!! That looks like totally fun! you seriously get to the do the coolest things everrr! haha can't wait for our meetup! yay!! Oh my gosh, are you serious?! You are famous AGAIN!!! Ahhhh!!!! I'm so jealous. We need to come to Cali asap!! you're such a celebrity!! taylor lautner?? um i am insanely jealous!